Purpose: This is a talent contest and to promote understanding of Punjabi American Heritage. It is not a beauty contest. Winner: Winner will get $500 scholarship and runners-up $250 in both male and female category. The scholarships will be provided by PAHS. 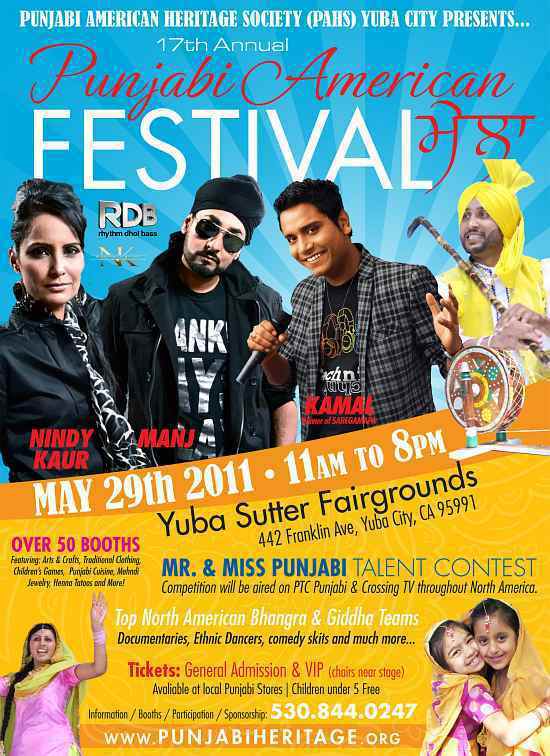 Date May 29th, 2011 at 17th Punjabi American Festival at Yuba Sutter Fairgrounds. All participants will report at 930AM at Fairgrounds on May 29TH and preliminary contest will be held in Expo Hall at 10.00 AM and 4 males and 4 females will be selected to compete on the main stage at 3PM in front of the festival audience. Your attire (10%), Talent 50 % (you can perform a dance or play instrument or comedy or do mimickery or sing or say poetry or any other special talent you may have for 3 minutes) answer to two questions (anwer in one minute to each question) from Judges 25% (content), language command 10 percent and 5 extra credit percent for your community work. Final event will be show all over USA by PTC Punjabi TV Dishnet network and Crossings TV on Comcast Cable.